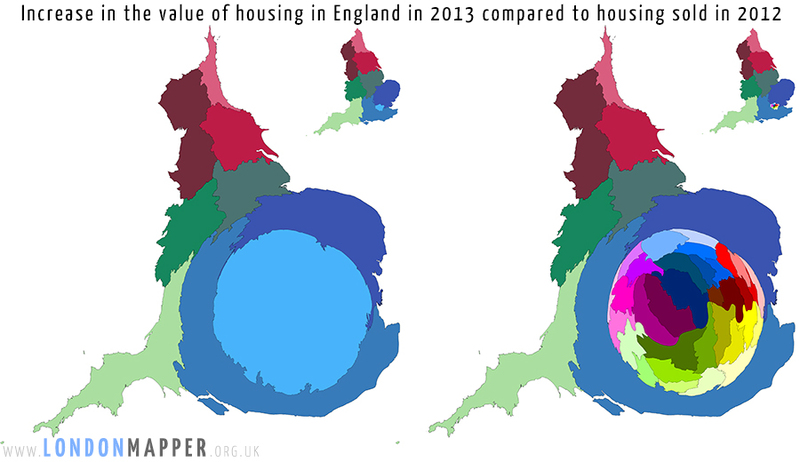 New research by Oxford academics reveals images of just how distorted both the country and the capital appears when land is shaped by the value of its residential property. This new analysis looks at the value of actual properties sold in the last year as this shows what is being achieved on the property market, compared to just looking at house prices assumed for all dwellings. When the total increase in house prices is multiplied by the number of sales made in each place, the total for England is seen to have risen by £33.7 billion. When weighted by price, a third (£11.2 billion) of housing sales were made in London; of that £11.2 billion, most of the rise occurred in a very small part of the capital. Increases in some parts of London were much smaller. For example, around £6,000 in Barking & Dagenham. “Prices in London are rising much more quickly than in England as a whole. If this continues then London will breach the half million pound price barrier for the average home in 2014. “Similar rises in incomes aren’t underpinning the property boom which means that something will have to give. “The house price bubble is not a good news story, especially for Londoners. These maps demonstrate in a visually explosive way the continued growth of inequality in the capital. “Not all Londoners benefit from increases in property values equally. A small minority, particularly those who own property in the wealthiest boroughs such as Westminster and Kensington & Chelsea, have seen huge increases. In boroughs such as Barking & Dagenham, rises have been much smaller at around £6,000 in 2013.